“Academic Heisman” to Urschel: What else is there to say about John Urschel? The “mathematician/guard,” as the headline on this USA Today story called him, received a particularly prestigious honor Tuesday night—the William V. Campbell trophy, given to college football’s top scholar-athlete by the National Football Foundation. (If you need a refresher, one of the earlier long profiles about Urschel, by Frank Bodani of the York Daily Record, is good reading.) 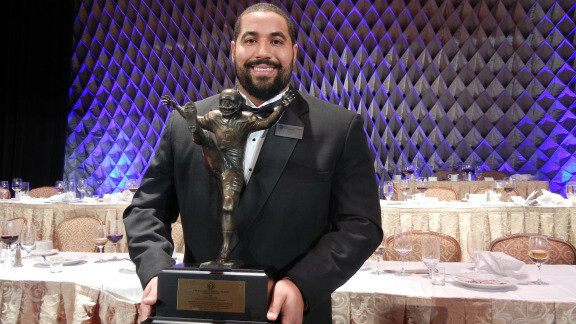 Steven J. Hatchell, president and CEO of the National Football Foundation, said that Urschel “represents everything that is right about college football.” At this point, let’s just hear from Urschel ’12, ’13g himself: Click here for this acceptance speech. It is, of course, terrific. Workin’ on the railroad: I’m not a huge fan of Google alerts, but I will admit that when they work, they are amazing. I did not know that Penn State Altoona is the only university in the country offering a four-year degree in rail transportation engineering until I read this piece from Progressive Railroading, which details the program and why it’s important: “Penn State launched the degree three years ago at the urging of railroad and transit executives who noted the need for more education and training designed for future railroaders.” Three years ago, the program enrolled its first nine students, and with a little word of mouth, they’ve got 19 more freshmen and sophomores. Health care back in the news: The Faculty Senate met Tuesday, and the hot topic was Penn State’s health care program, which received national attention this fall, first because it used sticks rather than carrots to spur employees toward healthy habits, then because of the controversy over whether employees were required to disclose too much personal information. That program was modified, and the university has appointed a committee to examine the issue, but the Faculty Senate still isn’t thrilled with how the committee is constituted. Entry filed under: Uncategorized. Tags: Faculty Senate, health care, John Urschel, rail transportation engineering.